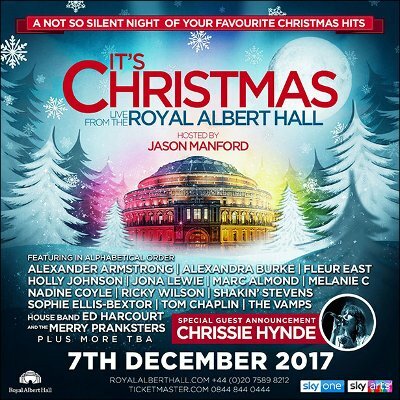 Britain's Sky One and Sky Arts, together with specialist live-events producer CC-Lab, have announced an all-star line-up Christmas concert at the iconic Royal Albert Hall, which will take place on Thursday, December 7, 2017. Some of the biggest names in pop are lined up to perform their favourite Christmas hits, old and new, at this festive celebration. Each performance will be caught on camera for a magical Christmas special to be aired on Sky One and Sky Arts over the holiday period, premiering on Sky One on December 23rd. Hosted by comedian, musical star and singer Jason Manford, the show will see an array of artists performing contemporary Christmas classics including Alexander Armstrong, Alexandra Burke, Fleur East, Holly Johnson (of Frankie Goes to Hollywood), Jona Lewie, Marc Almond, Melanie C, Nadine Coyle, Ricky Wilson, Shakin’ Stevens, Sophie Ellis-Bextor, Tom Chaplin and The Vamps and special guest Chrissie Hynde. I simply could not believe it when I was asked to host this extravaganza. I adore Christmas and I love Christmas music so to be on a bill which is essentially “Now That’s What I Call Christmas” Live is a dream come true! Shakey, Jona Lewie and Holly Johnson are as synonymous with Christmas as Santa Claus himself and the rest of the bill is unbelievable. It’s an honour to not only be hosting but to be singing a few Christmas hits myself with our fabulous orchestra. The musical director for the event is acclaimed singer-songwriter Ed Harcourt, who will lead his band, The Merry Pranksters. Harcourt is also putting together a choir and an orchestra specially for the event, which will be accompanied by the award-winning string quartet Dirty Pretty Strings. The emphasis will be on Christmas classics that everyone knows, loves and can sing along to. In addition there will be surprises in the form of unusual covers and collaborations. London’s iconic Royal Albert Hall provides its own magic to the evening. The great London concert venue will be transformed into a rock ‘n’ roll winter wonderland, complete with snowflakes, Christmas trees and sparkles aplenty. Reflecting the old-meets-new theme of the concert, the set and décor will mix the traditions of Christmases past with the flamboyance and fun of today’s festive season. It’s sure to be a truly memorable and not so Silent Night!